Chatot in game: 3,401 Who? Important notice! 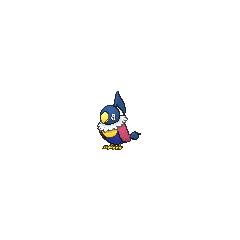 Pokemon Chatot is a fictional character of humans. 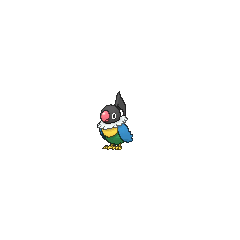 Chatot (Japanese: ???? 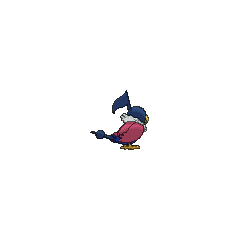 Perap) is a dual-type Normal/Flying Pokémon introduced in Generation IV. 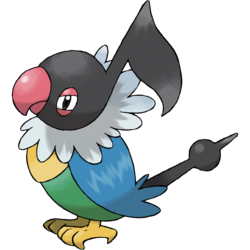 Chatot is an avian Pokémon similar to a parakeet. Its head is black and resembles an eighth note, while its black tail resembles a metronome. It plumage is brightly colored with blue wings, a yellow chest and feet, a green stomach, and a pink, hooked beak and eyelids. Additionally, there is a ruff of white feathers around its neck. This Pokémon’s tongue is similar to a human's, allowing it to imitate human speech. Chatot is also able to mimic the cries of other Pokémon, and uses this ability as a defense mechanism. Chatot uses the sounds it has learned and arranges them into its own melody, and flicks its tail to keep rhythm. 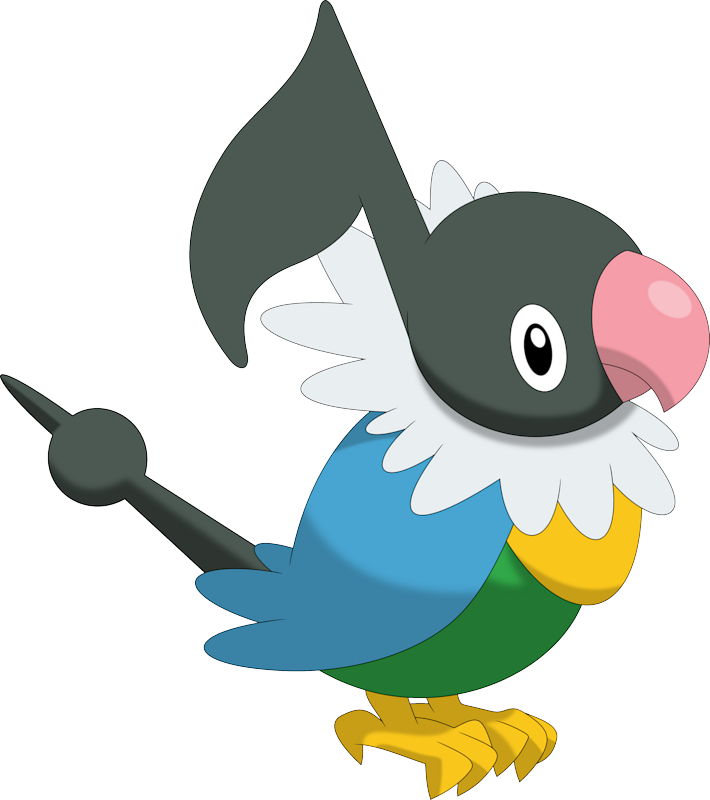 Chatot is the only known Pokémon that learns Chatter. Chatot first appeared in Pokémon Ranger and the Temple of the Sea as The Phantom's pet. Chatot made its TV episode debut in Strategy Tomorrow - Comedy Tonight, where it is in the ownership of Ada. A Chatot in All Dressed Up With Somewhere To Go! was the previous year's champion of the Pokémon Dress-Up Contest by singing like a Jigglypuff then a Lapras. A Chatot also appeared in Stealing the Conversation! as a partner of an Officer Jenny where it was kidnapped by Team Rocket. A Coordinator's Chatot appeared in Staging a Heroes' Welcome! participating in the Performance Stage of the Wallace Cup. An old man's Chatot appeared in Going for the Gold!. 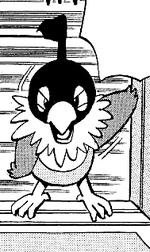 In Pokémon Adventures, Pearl owns a Chatot nicknamed Chatler who often smacks Diamond's Munchlax on the head. It, like a parrot, is able to perfectly mimic human speech, which it makes a habit of (although it cannot understand what it's saying). Perap may be a combination of parrot and rap. It may also derive from ???? perapera, which can mean "fluent in languages" but also "blah blah blah", referring to how incessantly some parrots will talk and chatter. Japanese ???? Perap Possibly from parrot and rap. May also derive from ???? perapera, which can mean "fluent in languages" but also "blah blah blah", referring to how incessantly some parrots will talk and chatter. Mandarin Chinese ??? Guo Zào Niao Literally "Clamorous/noisy bird".